web2py includes a powerful and customizable Role Based Access Control mechanism (RBAC). "Role-Based Access Control (RBAC) is an approach to restricting system access to authorized users. It is a newer alternative approach to mandatory access control (MAC) and discretionary access control (DAC). RBAC is sometimes referred to as role-based security. RBAC is a policy neutral and flexible access control technology sufficiently powerful to simulate DAC and MAC. Conversely, MAC can simulate RBAC if the role graph is restricted to a tree rather than a partially ordered set. Prior to the development of RBAC, MAC and DAC were considered to be the only known models for access control: if a model was not MAC, it was considered to be a DAC model, and vice versa. Research in the late 1990s demonstrated that RBAC falls in neither category. Within an organization, roles are created for various job functions. The permissions to perform certain operations are assigned to specific roles. Members of staff (or other system users) are assigned particular roles, and through those role assignments acquire the permissions to perform particular system functions. Unlike context-based access control (CBAC), RBAC does not look at the message context (such as a connection's source). Since users are not assigned permissions directly, but only acquire them through their role (or roles), management of individual user rights becomes a matter of simply assigning appropriate roles to the user; this simplifies common operations, such as adding a user, or changing a user's department. RBAC differs from access control lists (ACLs) used in traditional discretionary access control systems in that it assigns permissions to specific operations with meaning in the organization, rather than to low level data objects. For example, an access control list could be used to grant or deny write access to a particular system file, but it would not dictate how that file could be changed." The web2py class that implements RBAC is called Auth. auth_group stores groups or roles for users in a many-to-many structure. By default, each user is in its own group, but a user can be in multiple groups, and each group can contain multiple users. A group is identified by a role and a description. auth_membership links users and groups in a many-to-many structure. auth_permission links groups and permissions. A permission is identified by a name and, optionally, a table and a record. For example, members of a certain group can have "update" permissions on a specific record of a specific table. auth_event logs changes in the other tables and successful access via CRUD to objects controlled by the RBAC. In principle, there is no restriction on the names of the roles and the names of the permissions; the developer can create them to fix the roles and permissions in the organization. Once they have been created, web2py provides an API to check if a user is logged in, if a user is a member of a given group, and/or if the user is a member of any group that has a given required permission. web2py also provides decorators to restrict access to any function based on login, membership and permissions. web2py also understands some specific permissions, i.e., those that have a name that correspond to the CRUD methods (create, read, update, delete) and can enforce them automatically without the need to use decorators. In this chapter, we are going to discuss different parts of RBAC one by one. In order to use RBAC, users need to be identified. This means that they need to register (or be registered) and log in. Auth provides multiple login methods. The default one consists of identifying users based on the local auth_user table. Alternatively, it can log in users against third-party authentication systems and single sign on providers such as Google, PAM, LDAP, Facebook, LinkedIn, Dropbox, OpenID, OAuth, etc.. The password field of the db.auth_user table defaults to a CRYPT validator, which needs and hmac_key. The Auth.get_or_create_key() is a function that read the hmac kay from a file "private/auth.key" within the application folder. If the file does not exist it creates a random hmac_key. If multiple apps share the same auth database, make sure they also use the same hmac_key. If multiple apps share the same auth database you may want to disable migrations: auth.define_tables(migrate=False). The auth object and the user action are already defined in the scaffolding application. register allows users to register. It is integrated with CAPTCHA, although this is disabled by default. login allows users who are registered to log in (if the registration is verified or does not require verification, if it has been approved or does not require approval, and if it has not been blocked). logout does what you would expect but also, as the other methods, logs the event and can be used to trigger some event. profile allows users to edit their profile, i.e. the content of the auth_user table. Notice that this table does not have a fixed structure and can be customized. change_password allows users to change their password in a fail-safe way. verify_email. If email verification is turned on, then visitors, upon registration, receive an email with a link to verify their email information. The link points to this action. retrieve_username. By default, Auth uses email and password for login, but it can, optionally, use username instead of email. In this latter case, if a user forgets his/her username, the retrieve_username method allows the user to type the email address and retrieve the username by email. request_reset_password. Allows users who forgot their password to request a new password. They will get a confirmation email pointing to reset_password. impersonate allows a user to "impersonate" another user. This is important for debugging and for support purposes. request.args is the id of the user to be impersonated. This is only allowed if the logged in user has_permission('impersonate', db.auth_user, user_id). groups lists the groups of which the current logged in user is a member. navbar is a helper that generates a bar with login/register/etc. links. Logout, profile, change_password, impersonate, and groups require login. By default they are all exposed, but it is possible to restrict access to only some of these actions. All of the methods above can be extended or replaced by subclassing Auth. Any function can be decorated, not just exposed actions. Of course this is still only a very simple example of access control. More complex examples will be discussed later. auth.user contains a copy of the db.auth_user records for the current logged in user or None otherwise. There is also a auth.user_id which is the same as auth.user.id (i.e. the id of the current logger in user) or None. You can approve a registration via the appadmin interface. Look into the table auth_user. Pending registrations have a registration_key field set to "pending". A registration is approved when this field is set to blank. Via the appadmin interface, you can also block a user from logging in. Locate the user in the table auth_user and set the registration_key to "blocked". "blocked" users are not allowed to log in. Notice that this will prevent a visitor from logging in but it will not force a visitor who is already logged in to log out. The word "disabled" may be used instead of "blocked" if preferred, with exactly the same behavior. Other methods of Auth can be restricted in the same way. 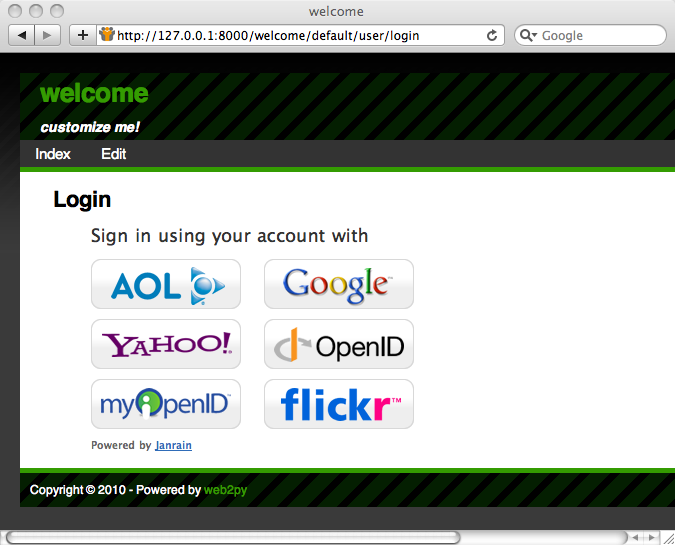 Integration with OpenID, Facebook, etc. You can use the web2py Role Base Access Control and authenticate with other services like OpenID, Facebook, LinkedIn, Google, Dropbox, MySpace, Flickr, etc. The easiest way is to use Janrain Engage (formerly RPX) (Janrain.com). Dropbox is discussed as a special case in Chapter 14 since it allows more than just login, it also provides storage services for the logged in users. Janrain Engage is a service that provides middleware authentication. You can register with Janrain.com, register a domain (the name of your app) and set of URLs you will be using, and they will provide you with an API key. The first line imports the new login method, the second line disables local registration, and the third line asks web2py to use the RPX login method. You must insert your own api_key provided by Janrain.com, the domain you choose upon registration and the external url of your login page. When a new user logins for the first time, web2py creates a new db.auth_user record associated to the user. It will use the registration_id field to store a unique id for the user. Most authentication methods will also provide a username, email, first_name and last_name but that is not guaranteed. Which fields are provided depends on the login method selected by the user. If the same user logs in twice using different authentication mechanisms (for example once with OpenID and once with Facebook), Janrain may not recognize his/her as the same user and issue different registration_id. The keys in the dictionary are fields in db.auth_user and the values are data entries in the profile object provided by Janrain. Look at the online Janrain documentation for details on the latter. Janrain will also keep statistics about your users' login. This login form is fully integrated with web2py Role Based Access Control and you can still create groups, make users members of groups, assign permissions, block users, etc. Janrain's free Basic service allows up to 2500 unique registered users to sign in annually. Accommodating more users requires an upgrade to one of their paid service tiers. If you prefer not to use Janrain and want to use a different login method (LDAP, PAM, Google, OpenID, OAuth/Facebook, LinkedIn, etc.) you can do so. The API to do so is described later in the chapter. To prevent spammers and bots registering on your site, you may require a registration CAPTCHA. web2py supports reCAPTCHA[recaptcha] out of the box. This is because reCAPTCHA is very well designed, free, accessible (it can read the words to the visitors), easy to set up, and does not require installing any third-party libraries. Register with reCAPTCHA[recaptcha] and obtain a (PUBLIC_KEY, PRIVATE_KEY) couple for your account. These are just two strings. reCAPTCHA may not work if you access the web site as 'localhost' or '127.0.0.1', because it is registered to work with publicly visible web sites only. Notice that use_ssl=False by default. options may be a configuration string, e.g. options="theme:'white', lang:'fr'"
More details: reCAPTCHA[recaptchagoogle] and customizing . If you do not want to use reCAPTCHA, look into the definition of the Recaptcha class in "gluon/tools.py", since it is easy to use other CAPTCHA systems. defines all Auth tables that have not been defined already. This means that if you wish to do so, you can define your own auth_user table. You can declare extra fields not just for table "auth_user" but also for other "auth_" tables. Using extra_fields is the recommended way as it will not break any internal mechanism. You can add any field you wish, and you can change validators but you cannot remove the fields marked as "required" in this example. It is important to make "password", "registration_key", "reset_password_key" and "registration_id" fields readable=False and writable=False, since a visitor must not be allowed to tamper with them. Refer to the documentation in the files themselves for each login method, but here are some examples. login methods that use a web2py login form (although the credentials are verified outside web2py). An example is LDAP. login methods that require an external single-sign-on form (an example is Google and Facebook). In the latter case, web2py never gets the login credentials, only a login token issued by the service provider. The token is stored in db.auth_user.registration_id. where the latter string is the base64 encoding of the string username:password. The service responds 200 OK if the user is authorized and 400, 401, 402, 403 or 404 otherwise. if the user does not exist in auth_user, a new user is created and the username/email and passwords are stored. if the user does exist in auth_user but the new accepted password does not match the old stored password, the old password is replaced with the new one (notice that passwords are always stored hashed unless specified otherwise). The same applies for any other login method described here. The first argument of email_auth is the address:port of the SMTP server. The second argument is the email domain. This works with any SMTP server that requires TLS authentication. Authentication using LDAP works very much as in the previous cases. Authentication using Google when running on Google App Engine requires skipping the web2py login form, being redirected to the Google login page, and back upon success. Because the behavior is different than in the previous examples, the API is a little different. We have previously discussed integration with Janrain (which has OpenID support) and that is the easiest way to use OpenID. Yet sometimes you do not want to rely on a third party service and you want to access the OpenID provider directly from the consumer (your app). Things get a little more complex if you want to use Facebook OAuth2.0 to login into a specific Facebook app to access its API, instead of your own app. Here is an example for accessing the Facebook Graph API. First of all you must install the Facebook Python SDK. "Returns the user using the Graph API"
We have previously discussed integration with Janrain (which has LinkedIn support) and that is the easiest way to use OAuth. Yet sometime you do not want to rely on a third party service or you may want to access LinkedIn directly to get more information than Janrain provides. LinkedInAccount requires the "python-linkedin" module installed separately. This works out of the box with Rocket (the web2py built-in web server) but you may need some extra configuration work on the web server side if you are using a different web server. In particular you need to tell your web server where the certificates are located on local host and that it needs to verify certificates coming from the clients. How to do it is web server dependent and therefore omitted here. If signals are set and a parameter in request matches any signals, it will return the call of other_form.login_form instead. other_form can handle some particular situations, for example, multiple steps of OpenID login inside other_form.login_form. Otherwise it will render the normal login form together with the other_form. You can read more about web2py API for emails and email configuration in Chapter 8. Here we limit the discussion to the interaction between Mail and Auth. in auth.messages.verify_email with the proper complete URL of the action verify_email. This is necessary because web2py may be installed behind a proxy, and it cannot determine its own public URLs with absolute certainty. although we do not suggest doing so. Users have membership in groups. Each group is identified by a name/role. Groups have permissions. Users have permissions because of the groups they belong to. returns the id of the newly created group. deletes the group with group_id. deletes the group with role "user_7", i.e., the group uniquely associated to user number 7.
returns the id of the group uniquely associated to the user identified by user_id. gives user_id membership of the group group_id. If the user_id is not specified, then web2py assumes the current logged-in user. revokes user_id membership of the group group_id. If the user_id is not specified, then web2py assumes the current logged-in user. checks whether user_id has membership of the group group_id or the group with the specified role. Only group_id or role should be passed to the function, not both. If the user_id is not specified, then web2py assumes the current logged-in user. gives permission "name" (user defined) on the object "object" (also user defined) to members of the group group_id. If "object" is a tablename then the permission can refer to the entire table by setting record_id to a value of zero, or the permission can refer to a specific record by specifying a record_id value greater than zero. When giving permissions on tables, it is common to use a permission name in the set ('create', 'read', 'update', 'delete', 'select') since these permissions are understood and can be enforced by CRUD. If group_id is zero, web2py uses the group uniquely associated to the current logged-in user. You can also use auth.id_group(role="...") to get the id of a group given its name. checks whether the user identified by user_id has membership in a group with the requested permission. returns all rows of table "mytable" that user user_id has "read" permission on. If the user_id is not specified, then web2py assumes the current logged-in user. The accessible_query(...) can be combined with other queries to make more complex ones. accessible_query(...) is the only Auth method to require a JOIN, so it does not work on the Google App Engine. The condition argument of @auth.requires(condition) can be a callable. @auth.requires also takes an optional argument requires_login which defaults to True. If set to False, it does not require login before evaluating the condition as true/false. The condition can be a boolean value or a function evaluating to boolean. Note that access to all functions apart from the first one is restricted based on permissions that the visitor may or may not have. If the visitor is not logged in, then the permission cannot be checked; the visitor is redirected to the login page and then back to the page that requires permissions. Using decorators and/or explicit checks provides one way to implement access control. are "read", "create", "update", "delete", "select", "impersonate". The attribute authorization of upload field can be None (the default) or a function that decides whether the user is logged in and has permission to 'read' the current record. In this example, there is no restriction on downloading images linked by the "small_image" field, but we require access control on images linked by the "large_image" field. Occasionally, it may be necessary to expose actions that have decorators that require access control as services; i.e., to call them from a program or script and still be able to use authentication to check for authorization. Basic login is often the only option for services (described in the next chapter), but it is disabled by default. login_bare returns user if the user exists and the password is valid, else it returns None. username is the email if the "auth_user" table does not have a "username" field. It must be set to something like "sha512:a-pass-phrase" and it will be passed to the CRYPT validator for the "password" field of the auth_user table. It will be the algorithm and a-pass-phrase used to hash the passwords. Approval consists of setting registration_key=='' via appadmin or programmatically. Do you want to allow basic login? This is the function called for the redirection. The argument url` passed to this function is the url for the login page. You can change this variable and redirect the user elsewhere. Often on_failed_authorization is a URL but it can be a function that returns the URL and it will be called on failed authorization. Each callback must be a function that takes the form object and it can modify the attributes of the form object before database IO is performed. If the .captcha settings points to a gluon.tools.Recaptcha, all forms for which the corresponding option (like .login_captcha) is set to None will have a captcha, while those for which the corresponding option is set to False will not. If, instead, .captcha is set to None, only those form who have a corresponding option set to a gluon.tools.Recaptcha object will have captcha and the others will not. Do you want to show the record id in the edit profile page? auth.messages.is_empty = "Cannot be empty"
auth.messages.mismatched_password = "Password fields don't match"
auth.messages.label_remember_me = "Remember me (for 30 days)"
add|del|has membership logs allow the use of "%(user_id)s" and "%(group_id)s". add|del|has permission logs allow the use of "%(user_id)s", "%(name)s", "%(table_name)s", and "%(record_id)s". web2py provides support for third party authentication and single sign on. Here we discuss the Central Authentication Service (CAS) which is an industry standard and both client and server are built-into web2py. CAS is an open protocol for distributed authentication and it works in the following way: When a visitor arrives at our web site, our application check in the session if the user is already authenticated (for example via a session.token object). If the user is not authenticated, the controller redirects the visitor from the CAS appliance, where the user can log in, register, and manage his credentials (name, email and password). If the user registers, he receives an email, and registration is not complete until he responds to the email. Once the user has successfully registered and logged in, the CAS appliance redirects the user to our application together with a key. Our application uses the key to get the credentials of the user via an HTTP request in the background to the CAS server. Using this mechanism, multiple applications can use a single sign-on via a single CAS server. The server providing authentication is called a service provider. Applications seeking to authenticate visitors are called service consumers. CAS is similar to OpenID, with one main difference. In the case of OpenID, the visitor chooses the service provider. In the case of CAS, our application makes this choice, making CAS more secure. (we assume the app to be called "provider"). When you visit the login url the consumer app, it will redirect you to the provider app which will perform authentication and will redirect back to the consumer. All processes of registration, logout, change password, retrieve password, have to be completed on the provider app. An entry about the logged-in user will be created on the consumer side so that you add extra fields and have a local profile. Thanks to CAS 2.0 all fields that are readable on the provider and have a corresponding field in the auth_user table of the consumer will be copied automatically. This is possible but dependent on the web server. here we assume two applications running under the same web server: Apache with mod_wsgi. One of the applications is web2py with an app proving access control via Auth. The other can be a CGI script, a PHP program or anything else. We want to instruct the web server to ask permission to the former application when a client requests access to the latter. Port 8002 is a must and there is no need to enable admin so no admin password. Then we need to edit the Apache config file (for example "/etc/apache2/sites-available/default") and instruct apache so that when the non-web2py program is called, it should call the above check action instead and only if it returns true it should proceed and respond to the request, else if should deny access. Because web2py and the non-web2py application run under the same domain, if the user is logged into the web2py app, the web2py session cookie will be passed to Apache even when the other app is requested and will allow credential verification. Here "^myapp/path/needing/authentication/myfile" is the regular expression that should match the incoming request and "/path/to/" is the absolute location of the web2py folder. which points to the web2py application we have requested but you can edit it to point to a specific application, running on a port other than 8002.